Soon to rejoin his regiment, Captain Stephen Overtree goes looking for his older brother Wesley, a free spirited artist who has slacked off on his duties as heir of the family estate. Stephen is dismayed to find that Wesley has left England for a painting trip to Italy. Not only that, he's also left behind one broken heart and an unborn child. Sophie Dupont never meant to let things go so far with Wesley, and she never dreamed he would leave before she could tell him about the upcoming baby. She can't hide her condition from Wesley's stern and observant brother, who shocks her by promptly proposing marriage in order to save Sophie and the child from ruin. Stephen's somewhat prescient former nanny has told him that she believes he won't live to see his inheritance, and acting on the knowledge that she could be a respectable widow in the near future, Sophie accepts Stephen's offer. The two travel to Overtree Hall, where they try to hide the fact that they are strangers from Stephen's family and friends. How long can Sophie keep her pregnancy a secret? Will Wesley return, and what will he think if he figures out he is the father of Sophie's child? As Stephen returns to military service, he doesn't know if he'll come back, or how the relationship might change with the woman he is swiftly coming to love. This book from Julie Klassen holds some of her classic Regency mystery style, though not as much as her earlier releases. I felt there was a lack of emotional depth in the plot, as there seemed to be a lot of telling rather than showing with regard to characters' feelings. I was also somewhat taken aback at the kinds of things mentioned in conversation, as on a few occasions they did not seem appropriate to the time period. I would recommend this and other Klassen stories to fans of the Regency Era. After a charming first novel in The Innkeeper of Ivy Hill, Julie Klassen's Tales from Ivy Hill series continues with this delightful second installment. We continue following the lives of Jane and Thora, as well as other ladies in this community. Mercy Grove runs a small private girls school out of her home at Ivy Cottage. Having never married, Mercy tries to fill her life with the joy of serving her pupils and being a good friend. When the elderly relative of one of her students asks Mercy to become the girl's guardian and raise her as her own, Mercy's heart opens to new possibilities. Having lost her home to a male cousin upon her father's death, Rachel Ashford finds herself joining Mercy at Ivy Cottage. The only inheritance Rachel received was a large collection of books, and in order to earn some income she considers opening a circulating library. She's also being courted by her cousin, who feels poorly about taking over the family home. Yet Rachel has never gotten over her youthful crush on local magistrate and childhood friend Sir Timothy Brockwell, who seems to be showing up more often himself these days. Mercy and Rachel grow together in hope and experience as they support one another through their challenges. When Mercy's parents strictly oppose the ideas of a library and Mercy taking on a young ward, they come to visit with a potential suitor and make their wishes perfectly clear: The time has come to marry for duty or risk losing everything. This novel was much easier to get into, having already established the characters. I look forward to reading more stories in this series when they are released in the future! It had been quite a while since I read anything from Julie Klassen, and this new series is something a little different than what she's done before. I think that's a good thing - sometimes her Regency mysteries got a little too formulaic for my taste. However, this book started off so slow for me! It took me nearly 4 weeks to finish it, which is highly unusual, but by the end I really loved the characters and was glad I had Book 2 to pick up immediately. Our story opens with Jane Bell, a young widow whose husband has left her the coaching inn which had been in his family for several generations. Jane grew up a gentleman's daughter and it had been somewhat scandalous that she had married a working man, and now she is having to learn the business herself. This was never what she expected out of life. Thora, Jane's mother-in-law, comes to visit, and is still in deep mourning after losing her husband, her son, and the inn which had been such a big part of her life. She can see that Jane is in over her head, but has to admire the young woman's determination. But things appeared stacked against these ladies. They find out that before Jane's husband died he had taken out a secret loan from the bank which is now coming due. A new coaching inn is opening up closer to the turnpike and may steal their business. And all the while relationships around Ivy Hill are being tested and refined as these women pull together for each other and their livelihood. There was much to love about this story! It reminded me at times of British village dramas like Cranford and Lark Rise to Candleford, while Thora reminded me of Mrs. Thornton from North & South. There were so many wonderful characters to come to know in Ivy Hill, and a few romance angles which I am interested in seeing continue throughout the rest of the series. Be watching for my review of Book 2, The Ladies of Ivy Cottage, coming soon! Hannah Rogers has earned her living as a companion to the flirtatious Lady Mayfield. When Lady Mayfield's husband swiftly ushers them out of Bath in order to try to reclaim his marriage, a carriage accident washes Lady Mayfield's body out to sea and severely injures Hannah and Sir John. By the time Hannah regains her senses several days later, everyone has assumed she is Lady Mayfield, and she thinks it may be best to keep that presumption alive until she has the chance to decide what to do, especially since Sir John lies unconscious with recovery uncertain. There is only one thing that Hannah must do: find a way to redeem her young son from the corrupt maternity home matron who is holding him hostage for monies owed. Hannah had managed to keep her pregnancy a secret, but her heart is with her son and no matter what the future holds she wants to be reunited with him. It is easy to tell strangers that Lady Mayfield has a son, and though Hannah intends to quit the ruse and start life over as soon as she has Danny back in her arms, it may not be that simple. Especially when Sir John's new solicitor arrives with a hostile attitude towards her, believing her to be the unfaithful wife. And when Sir John himself awakens, Hannah is completely unprepared for his response to her deception. In this novel Julie Klassen has branched out from her original publisher, and I have mixed but strong feelings about this. On the positive side, it allowed the author to break out of her usual cloudy mystery format, which was a vast improvement in my opinion. I enjoyed the more straightforward telling of this novel, which is not at all to say that there were no twists and surprising turns, because there certainly were. On the other hand, going with a publisher not devoted to Christian novels opened the door for the author to include a lot more innuendo, adult situations, and mature content. I have read many other Klassen novels through the years and never once have I stopped and thought, "You know what this scene needs? Innuendo. Lots of innuendo." Unfortunately there's enough in this book to more than make up for what was not included in the rest. I had a few other complaints about this story, and it was hard to fully enjoy it since the content made me so uncomfortable. I would strongly caution younger readers away from this book, as it departs so far from Klassen's wholesome reputation. I am disappointed with it, but will still be reading her future Bethany House releases in hopes of a return to clean and inspiring Regency fiction. A responsible eldest daughter and a house full of secrets take the stage in the latest Regency novel from Julie Klassen. Abigail Foster advised her father to enter into an investment scheme, and now that they've lost nearly everything she is taking it upon herself to help make the transition to a smaller income. As she assists her father in searching for a new place to live, they are approached by a lawyer handling the estate of a distant relative. He says he is authorized to offer them the use of an old manor house, Pembrooke Park, which has been shut up for eighteen years after the mysterious disappearance of the previous owners. The strangeness of the situation does not hold back the Fosters from accepting the lease. Abigail is searching for redemption as she travels to the country ahead of her family to help get the house ready for their arrival. Soon she hears rumors of a hidden room and secret treasure squirreled away somewhere in the old house, and is warned of fortune hunters who might try to break in. The manor has been guarded by the formidable former manager, but he and his family welcome Abigail to the neighborhood once they realize her claim to leasing the place is legitimate. 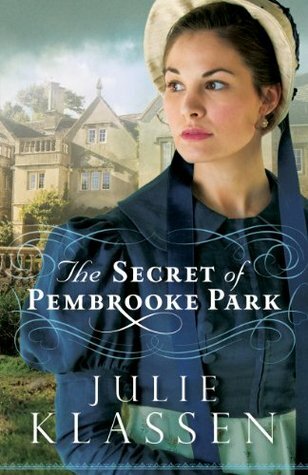 The Pembrooke family history is full of hints of murder and danger, and Abigail is unable to be completely at ease in Pembrooke Park. She soon begins receiving anonymous letters which include journal entries from a young lady who lived there previously. She's warned not to open her doors to anyone with the Pembrooke surname, but when her father invites their distant cousin, Miles Pembrooke, to stay with them, there's not much she can do. It's clear he is there to poke about the place and try to find the hidden treasure for himself. William Chapman, the local curate and son of the former estate manager, becomes a trusted ally for Abigail. She's drawn to his relationship with God, and his friendship is a balm after the man she thought she would marry seems to have passed her up in favor of her younger sister. Although William knows many of Pembrooke Park's true secrets, he wants nothing more than to see joy come to the sweet and serious Abigail. His meager living as a clergyman's assistant does not leave much hope that he could support a wife and family, but he knows he's meant to be right where he is. The mystery runs deep in this novel and the fullness of it will keep you guessing until the end. Who is Abigail's secret correspondent? Who is the true heir to the estate? Are the Fosters really in danger living there? Seeming to draw inspiration from Jane Austen's "Northanger Abbey," this was another good novel by the woman who sets the standard in Christian Regency fiction. Julie Klassen's releases are always much anticipated. 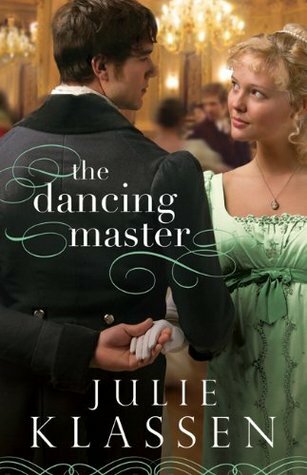 "The Dancing Master" is her first book which features a man as the main character, and I thought she captured Alec Valcourt well. Alec arrives in Beaworthy with his mother, his sister, and a big secret. But a hindrance even bigger than his secret is keeping him from following his profession as a dancing master: the matron of the village long ago forbade all dancing, and the villagers live in fear of crossing her. Alec must pursue another form of employment to support his family. Secrets were a very big part of this story. I enjoy the air of mystery that Klassen brings to her tales, but I didn't think these were done as well as some others. Alec's secret was easy to guess, and I felt if we had known it from the beginning we would have identified with him even more. The revelation of Julia's secret was strung out over many conversations and misadventures instead of just one good heart-to-heart. The last Klassen book that I read was The Silent Governess, in which "Who are my real parents?" was the mystery for both main characters, and though I realize the former was released in 2009 and therefore most people won't read these two close together, it was a little tiresome to revisit that topic so soon for this reader. This book has a great cast of minor characters who bring a lot to the story. My favorite was Mrs. Tickle, the baker who makes sure Alec is well fed and is always quick to provide cakes for big occasions. There's some interesting religious history sprinkled throughout, too. Alec's uphill battle to get bring dancing back to Beaworthy is an enjoyable story. I'd like to see Klassen do another hero-centric novel in the future. Just be warned: reading this book might make you want to take English Country Dancing lessons! If that sounds more fun than trepidatious, this could be the book for you. There aren't many authors who have their own tag here on my blog, but Julie Klassen is one of them. Now that I have finished this 2009 release, I can say I have read every one of her published novels, and am eagerly awaiting the opportunity to review her upcoming December release. You could certainly say that I am a fan. 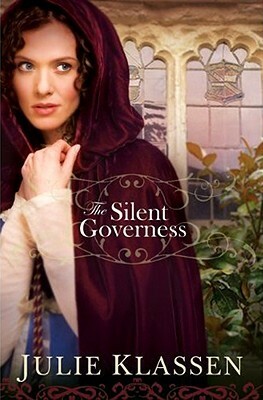 I would have loved "The Silent Governess" even if it hadn't been a Julie Klassen book. The plot is full of intriguing mysteries and characters, and you really can't guess what is going to happen next. Our heroine, Olivia Keene, is fleeing her family home at the opening of the book, afraid she killed her father after defending her mother from a violent attack. Her mother urged her to find a position as a teacher at a school many miles away, promising that when it is safe she will come for Olivia. Along the way Olivia is sidetracked by people with both good and bad intentions, and winds up in the wrong place at the wrong time, being caught on the Brightwell Estate after accidentally overhearing a secret that would destroy Lord Edward Bradley if it were to ever get out. Lord Bradley doesn't really have a choice but to keep the young trespasser as part of his household staff, where he can keep an eye on her to ensure her silence. As he wrestles with what to do over the dreadful news that has just been revealed to him, he can't help but be very suspicious about Olivia, her intentions, and the secrecy surrounding her own background. As the months pass, Olivia worries about how to hear from her mother, as she never reached their rendezvous point. Lord Bradley broods over what is the right course of action, fearful of what his contemplations may lead him to do. His father, Lord Brightwell, wonders if the dark-haired young woman might not be the daughter he never knew he had, and wants to do everything he can to help Olivia, if only she will let him. I am happy to report that the layers of mystery all work themselves out wonderfully in the end. There are no easy outs in the solutions, and not everything is wrapped up as the readers might deem perfect, but it is very well done. I cried over the last few paragraphs, which does not happen often. If there are any Regency fans not reading Julie Klassen's books, I cannot urge you strongly enough to get to a bookstore and pick one up. You are sure to be delighted! There is something for all Jane Austen fans to love in Julie Klassen's works! 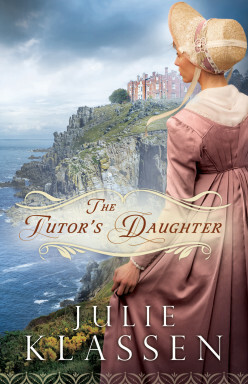 In her latest, "The Tutor's Daughter," I saw glimpses of Northanger Abbey, Pride & Prejudice, and Sense & Sensibility. Touches of du Maurier's Rebecca and Bronte's Jane Eyre, too. Of course this novel has its own story, but there's no doubt Klassen drew some inspiration from these classics, which remain well-known for that very reason! Emma Smallwood is a sensible yet curious young woman who grew up helping her father run Smallwood Academy. After her mother's death, her father grows restless and allows the number of his pupils to dwindle. When they receive an invitation to come privately tutor the younger sons of a baronet, Mr. Smallwood jumps at the chance and soon Emma finds herself making a new home at the seaside manor of Sir Giles Weston. The older sons, Henry and Phillip, had studied under Mr. Smallwood in previous years. Emma is especially looking forward to renewing her friendship with Phillip. Mr. Smallwood and Emma's arrival at Ebbington Manor turns out to be very different from what they expect. The family seems to be in some measure of disarray, and Lady Weston shows a surprising degree of disapprobation towards them. Soon mysterious happenings begin catching Emma's notice. Items appear in her bedroom which were not there when she went to sleep. On other nights she is awakened by beautiful music coming from the other side of the house, but no one will confess to being the midnight musician. When Henry arrives back at the Manor, his stern demeanor is everything Emma remembers, while Phillip is as affable and companionable as ever. Within weeks it is quite apparent that Ebbington Manor and the Weston family have a hidden secret. Why is the north wing strictly off limits? Who makes wailing noises during storms? Whose opinions can Emma trust and who is looking out for their own interest? I could not put this book down once I got to the heart of the story. Early on I had trouble connecting with Emma, and then the sudden and unexpected introduction of another character's point of view on page 85 was as jarring to me as the Smallwoods' arrival was to Lady Weston! But it also made the novel more intriguing, and after that it was a race to the finish to see the mysteries unravel and if true love would triumph in the end. Click here to see more reviews of "The Tutor's Daughter." Also be sure to check out Julie Klassen's website for more information on all her releases. I received this book from LitFuse Publicity in exchange for this honest review. All opinions are my own. Want to win a copy of this book and maybe a prize package? Information here! 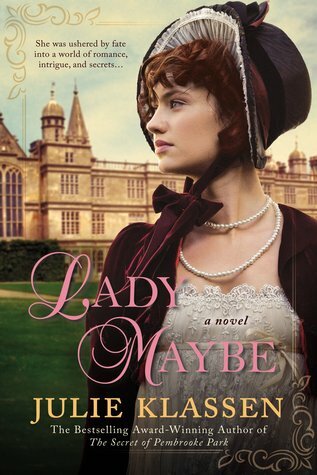 Julie Klassen's latest Regency Romance had me from the first sentence. Margaret Macy lives in London with her mother, siblings, and scheming step-father. Knowing of Margaret's upcoming inheritance from a distant relative, step-father Sterling is pressuring her to marry his nephew in order to keep the money in the family. When Margaret overhears Sterling telling his nephew to marry her even if he must compromise her reputation first, Margaret flees the house with only a few belongings to escape the trap set for her. With only three months until her twenty-fifth birthday, when the inheritance will become her own, Margaret leaves London and disguises herself as a maid seeking employment. She is hired to work at Fairbourne Hall, the country estate of the Upchurch siblings, whom Margaret knows from town. Both charming eldest son Lewis and serious younger son Nathaniel have courted her in the past. Their sister Helen has mourned the death of her fiance for several years and has remained at Fairbourne Hall rather than spending recent seasons in London. Margaret decides not to confide her secret to the family and sets into life belowstairs. Used to the life of a privileged lady, Margaret has never even undressed herself or made a bed before. It's a rude awakening to suddenly be scrubbing floors and emptying chamber pots. Her identity is constantly in danger of being revealed, both from her inexperience as a maid and from meeting the Upchurch family in the course of her duties. Who will be the first to discover her as an imposter? How far will Sterling go to flush her out from hiding? This was a real page-turning read for me and by far Klassen's best work yet. 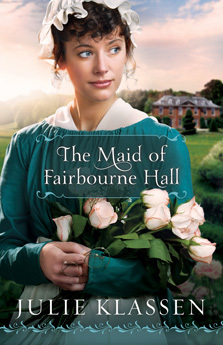 One of the things I liked about "The Maid of Fairbourne Hall" was that it was highly unpredictable. One thing that I didn't like was that the author seemed to feel the need to show how degrading the work of a maid was in the 19th century by mentioning chamber pots over and over again. I realize that it's a real and unpleasant part of history but I felt it was over-used as a devise to show how delicate Margaret must adjust to life in service. My only other quibble with the novel was that towards the end the romance, although very clean, was played up more than I personally prefer. This is definitely the right story for this time, as interest in lives of English servants is surging with popular shows such as "Downton Abbey" on the airwaves. Klassen has capitalized and brought a very satisfying story to life, complete with not only villains but also characters with true Christian morals. Thank you to Julie Klassen and the Bethany House team for bringing us something so enjoyable! I received my copy from LitFuse Publicity Group in exchange for this honest review. They've put together some great prizes to celebrate this release. Check them out below! Don't miss a moment of the fun. RSVP today and tell your friends via FACEBOOK r TWITTER nd increase your chances of winning. Hope to see you on March 15th!